Because of the scarcity now of the bigger indie polish brands, many people, including myself are turning to the up-and-comers on Etsy for a new source of indie glitters. This is Rockstar Nails Cotton Candy. Cotton Candy is a mix of small pink and turquoise blue hex glitters, as well as large magenta hex glitters in a clear base. At first, the large glitters seemed a little out of place for me and then after I swatched it, I actually like them there. The two pictures above show one coat of Cotton Candy over 2 coats of Zoya Shelby. These pictures show one coat of Cotton Candy over 2 coats of OPI Ski Teal We Drop. 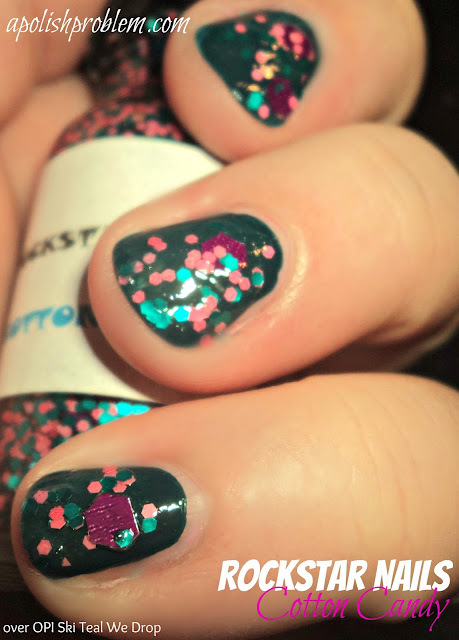 Cotton Candy is a super-fun glitter topcoat. 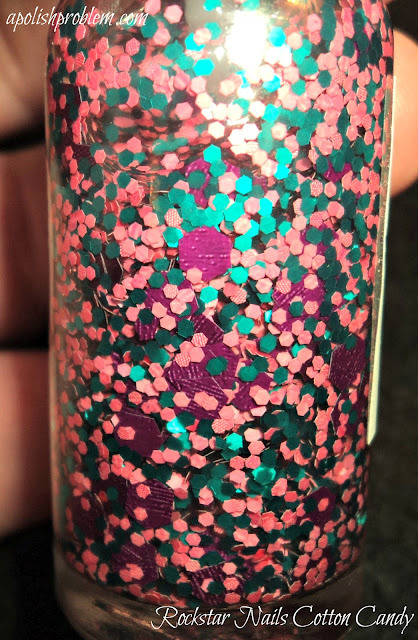 I know, oftentimes, we see a indie glitter topcoat, just jam-packed with a dozen colors of glitter and while those are so pretty, I also like that this one has just 3 colors. It actually makes it easier to chose a base color. The formula was a little on the thick side, but that's just the nature of indie glitters. The pink and blue glitters came out of the bottle quite nicely. I did have to go fishing for the large hex glitters, but, again, that's normal. I really liked Rockstar Nails Cotton Candy. I especially loved it over Ski Teal We Drop. It was the second one I swatched and if I had had the time, I totally would have done a full manicure with it. You can find Cotton Candy, as well as other glitters in Rockstar Nails' Etsy Shop (I'm totally eyeing Taste the Rainbow and Retro Dots. LOL). However, I don't see Cotton Candy currently listed, though, I'm sure it will be restocked soon. Rockstar Nails polishes sell for $8.50 a bottle and currently, Erika is giving away a toe separator in your choice of color, with each purchase. 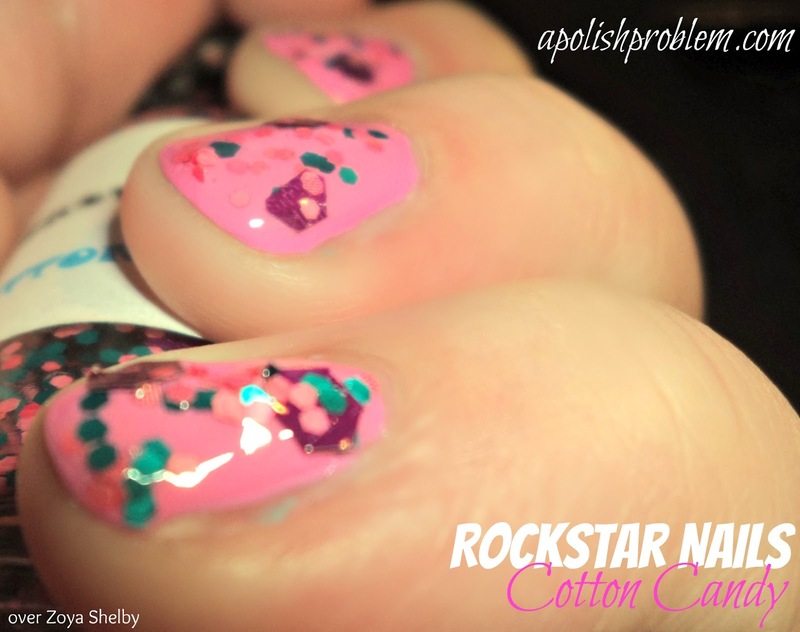 Rockstar Nails Cotton Candy was sent to me for review. The above links link to Rockstar Nails' Etsy shop and are not affiliate links. I hadn't even thought of visiting Etsy to look for indie nail polishes, what a great idea! I agree with your opinion on having just three colours, some of the polishes that have tooo many glitter colours can overwhelm the basecoat. Great review! Thank you for putting Rockstar Nails on my radar. I'm going to check them out on etsy! I'm also going to start following you on twitter because I'm loving this site! I like it on top of the pink!!! Ohhh, I quite like this! It looks great over both the pink and the teal base.